People may believe that their health insurance plans cover them wherever they are in the world, but this is not necessarily the case. In most instances, people will not be able to present their health insurance cards in a foreign country and expect their insurance companies to pay for the treatment they receive. This is especially the case for Medicare recipients who do not have supplemental coverage. Because this is true, they will need to have travel medical insurance. Travel medical insurance (also known as travel health insurance) is part of a trip insurance package, and it is very similar to the health insurance coverage that people have in the United States. If they become ill or are injured while on vacation, they may have a travel insurance policy that pays for hospitalizations. If they need surgery, prescriptions drugs or need to be evacuated by helicopter or ambulance, their travel medical insurance policies may pay for these things. Some plans also pay for follow-up visits to their foreign doctors. Purchasing trip insurance that contains medical insurance is highly important. Because an American insurance company may decline to pay a majority of the costs incurred in a foreign country, people may find that they have extremely high medical bills to pay on their own when they return home. Travelers must also consider the fact that they will be in a country where they may not speak the language. If this is the case, they will be unfamiliar with the healthcare system and where they can find a doctor or a hospital. When people purchase travel insurance that has medical coverage, they will have an advocate who can assist them in the language of each particular country. They will also be able to point them in the direction of an English-speaking doctor that they can trust who is within the insurance company’s network of physicians. What Does Travel Medical Insurance Contain? If people find that their health insurance policies will not cover them adequately for significant medical costs, they can purchase travel medical insurance within their travel insurance policies. Along with medical coverage, trip insurance provides them with insurance against lost luggage, trip cancellation due to bad weather and coverage for their rental cars. 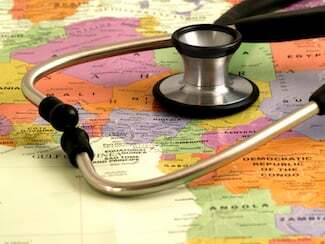 Travel medical insurance can be purchased for a single trip. However, some people travel several times throughout the year. Rather than purchase four insurance policies for four different trips, frequent travelers may purchase a policy that covers them for the year. This type of policy is also excellent for those who are planning an extensive trip abroad for business or school. A travel medical insurance policy would cover these instances when the family’s health coverage back home would be unable to contribute.